Venice's most popular waterbus line is convenient for transportation and sightseeing, if you know how to avoid the crowds. ABOVE: A Linea 1 water bus makes its way up the Grand Canal. Venice's ACTV transit network has more than 20 different waterbus lines that operate within the city center and to islands in the Venetian Lagoon. Of those nearly two dozen routes, the one that's likely to be most important to you is the Linea 1 vaporetto, which runs between Piazzale Roma (Venice's gateway for bus and land taxis), the Venezia Santa Lucia Railroad Station, the Rialto Bridge, Piazza San Marco, and the Lido di Venezia (Venice's beach resort on the Adriatic). As the Line 1 vaporetto follows a zigzag path up the Grand Canal and across St. Mark's Basin to the Lido, it stops at 21 different stations during its 58-minute trip. With boats running at intervals of about 12 minutes during the day and 20 minutes in the early morning and late evening, Line 1 is popular with residents and tourists alike. For transportation to points along the Grand Canal, to Venice's waterfront beyond the Piazza San Marco, or to the Lido di Venezia. To cross the Grand Canal when you aren't near a bridge or gondola-style traghetto service. To enjoy spectacular views of Venice's most beautiful palazzi, which line both sides of the Grand Canal. For most visitors, Line 1 is a simple (if slow) way to reach the Piazza San Marco and other key sites after arriving in Venice by airport bus, land taxi, train, or cruise ship. You buy an ACTV waterbus ticket or Tourist Travel Card, board a Line 1 boat at Piazzale Roma or the railroad station, and stay on until you reach your destination. That sounds easy enough, but be warned: Line 1 can be jam-packed with tourists during high season (roughly mid-April to mid-October), at holiday periods, and on busy weekends. Waiting times at busy stations like Piazzale Roma, Ferrovia (the railroad station), Rialto, and San Marco Vallaresso can be long. Because of this, we do not recommend using Line 1 if you're traveling with luggage (e.g., to a hotel). See our Picking the Right Hotel Location article for advice on where to stay with the least transportation hassle. 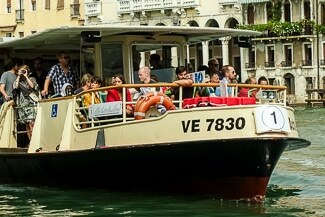 Venice's transportation agency charges a jaw-dropping €7,50 for a single ride on a public water bus. If you're on a tight budget, we recommend walking. 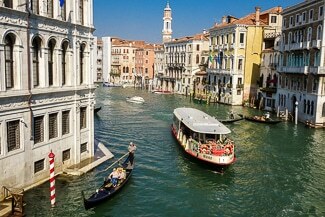 (Distances are short in Venice, although the city does have more than 400 footbridges with steps.) An ACTV Tourist Travel Card can be cost-effective if you plan to ride water buses more than a couple of times in a day. Boats tend to be less crowded as you go toward San Marco and the Lido in the evening, when daytrippers are heading back to the railroad station and buses in the Piazzale Roma. If you're arriving late in the day with luggage (preferably a single small suitcase or backpack), taking a Line 1 vaporetto in the San Marco direction is likely to be easier than it would be during the daylight hours. Only four bridges cross the Canal Grande, which measures about 4 km or 2.5 miles between the Piazzale Roma and the Piazza San Marco. 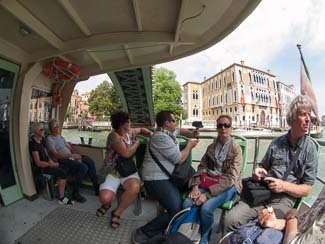 A handful of large gondolas called traghetti (ferries) provide a shuttle service across the canal at other locations, but schedules can be spotty (especially outside of business hours). Hopping on and off the No. 1 vaporetto offers an easy, cost-free way to cross the canal at many points if you've purchased an ACTV Tourist Travel Card and don't need to buy a single-trip ticket. 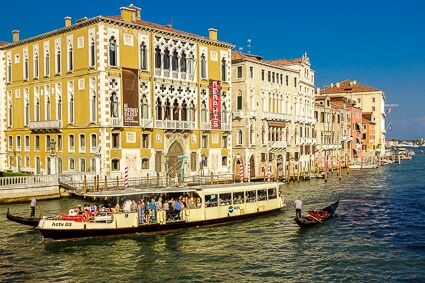 During its hour-long trip along the Grand Canal, the No. 1 vaporetto passes more than 170 buildings, including palazzi in a variety of architectural styles that date back, in some cases, to the 13th Century. Some of these palazzi are now hotels, others are civic buildings (including the municipal Casinò), a few are museums, and many are still private residences. They're especially beautiful at night, when you can catch glimpses of beamed ceilings, elaborate chandeliers, and other interior features from your floating observation platform. We recommend waiting until sundown and grabbing a Line 1 vaporetto at the first stop (see the Piazzale Roma page of our ACTV station directory or view this map for information on where to board). Ride the boat to the end of the Grand Canal at San Marco Vallaresso or--better yet--to San Zaccaria, which faces St. Mark's Basin just beyond the Piazza San Marco. If you have more time, continue to Arsenale, Giardini, or Sant'Elena and walk back to the city center along the waterfront. Best of all: If you have an ACTV Tourist Travel Card (which will make it unnecessary to buy a return ticket), go to the end of the line at Lido - Santa Maria Elisabetta (a few minutes across the water from Venice's historic center), then return on Linea 1 or another boat. ABOVE: Older vaporetti have open-air seating in the bow (unlike newer models, such as the boat shown in the inset photo, where bow seats have been replaced by stacks of life rafts). If you're lucky and find yourself boarding an old-style boat, move quickly to the bow and grab a vacant seat. Do not stand in the bow area while the boat is moving, or you'll block the pilot's line of sight. ABOVE: All vaporetti have limited open-air seating in the stern, behind the passenger cabin. These seats offer good views and photo opportunities. To reach them, walk through the enclosed cabin to the aft swinging doors. Note: You can also stand in the boarding area of the water bus (in front of the passenger cabin, behind the pilothouse). You may find it hard to enjoy views, however, because this area tends to be packed with people during high season or on weekends when a lot of tourists are in town.